16 days in Indonesia has inspired me to write again. It’s something which I miss doing for a long time. Being away from the city made me reflected on my life. 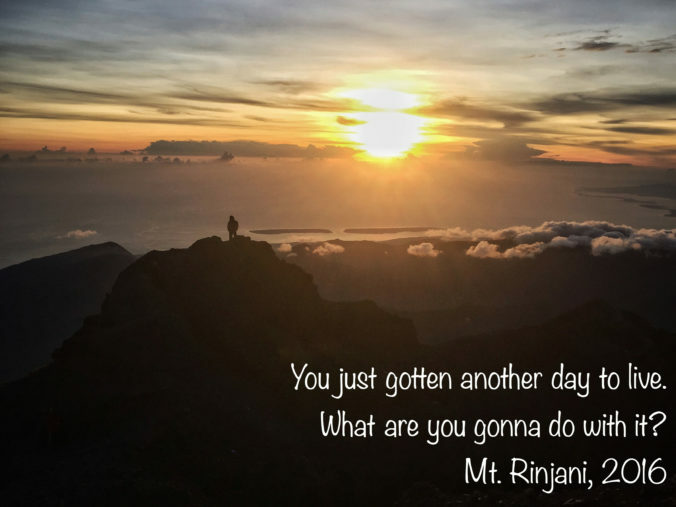 2 attempts to climb Rinjani definitely hit a core in my soul, with me questioning why the failed first attempt that lead it to the second attempt. It’s not just a mountain climbing thingy, it’s about how life is handled in the process of climbing the mountain and here’s my 5 key takeaways. 1. No goal is ever too big if we actually focus on the steps. It was cold and windy. After zipping up my jacket, off we went. 2 hours after the depature from the basecamp, the summit could be seen. My legs were starting to feel the sore in my calves and thighs. It just seem possible and but yet every 3 steps I took, I felt like i have fallen back one step because of the fine volcanic sand and rocks. There’s no proper steps made for this hike, and yet reaching the summit seems possible. One hour passed and I started to question myself whether it is even possible – I know I moved higher, yet the summit still seem distant away. The redness of the cloud is starting to show on my left and my body is starting to feel the pain. Every 10 steps I took, then I look up towards the summit again, wondering how long more I had to walk to reach it. The constant lookup was so brain drain as the summit which should already be closer still be seen as very far away. After a struggle of 4 hours since I left the basecamp, I gave up, found a big rock to hide from the wind and lay there till my friends got down. After the entire 3D2N hike from the 1st attempt, my friend Teng then shared the strategy of him walking 5 steps and take few seconds to catch a breather, and that was when I knew, it was possible to reach the summit if I do it again. Because I was focusing on the goal too much which affected me mentally. Instead, I should kept a strong focus on the steps and the goal will eventually happen. And that is similar to life, we all know where we wanna go, but sometimes we question how should we go and what should we do. Goal can only be reached if we start taking steps, even if it’s the wrong step, because remember every 3 steps that we take, we may just fall back 1 step. If we focus on the goal too much and when we are far from the goal, we will then question if the goal is actually too big, hence we compromise and reduce our goals. However, if we focus on the steps, irregardless of how many steps it takes and just continuing taking the steps, we will eventually get there. My coach once told me, there’s no unreasonable dreams, only unreasonable timeline. Hence, all we have to do is to take the steps, and continue taking them. Know our goal but don’t look at it took often. We just have to focus on the steps and trust that we will eventually get there. Half way through my climb from the basecamp, I was really sleepy. Every 2 steps I took, I closed my eyes for 2 seconds – almost similar to sleep hiking. I was really tired because I didn’t sleep much for several days before my trip – averagely about 4 hours a night, as I was rushing to finish off my work. Self sabotaging for some people is what they do best, whether it’s consciously or subconsciously and I’m one of them. Knowing that I was signing up for a suicide mission, yet I didn’t prep myself better to get my work done way earlier to get enough rest. And with that, I had to pay the price of attempting it a second time, with extra money and time and that same goes with life. When we self sabotage ourselves, the price we have to pay could be a lot. And Rinjani has taught me a painful lesson. Taking a step back to recognise the pattern of self sabotaging will really help us to propel further in achieving what we wanna do. Then again, if it’s not for the failed 1st attempt, I wouldn’t be able to write this article, as every failure, it’s a feedback for us to be better. Failure is always just a feedback on how much we are we deviating from our own goal. It doesn’t mean that we can’t. Once we go through failure, it just means success is closer, cause we now know how tough it is. It builds our body, mind and soul to adapt to the toughness. When I was in the car to the harbour after my first attempted hike, my mind was questioning whether it is actually possible if I were to attempt it again. When I think about the mistakes I made, and what other strategies or solutions I need (a walking stick and just focusing on the steps in this case), that is when I know it is possible to get back on track and achieve it. That was when I knew I have to do it again. And when the intention is clear to do something, we will do whatever it takes to achieve it. With that, I bought a new plane ticket to extend my stay and signed up for a 2D1N climb before I head back home. I just know that I want to give it a shot again. In my 2nd attempt, it was so much easier mentally and physically as compared to the first attempt as my mind and body as grew to adapt what was coming. That is what I would encourage everyone in just taking a step to do what they need to do to achieve their goal. Because once we gone through something for the second time, everything just becomes much easier and that is why getting back on track to try it again is crucial. 4. The people and the environment around us can be a strong conditioning factor. Hang out with fast pace hikers will condition yourself to be fast pace. The people we have on our side will condition how we think and react and that is why there’s so many articles saying that we should surround ourselves with positive people and that’s true. Want a bigger impact? Take the environment around you as a conditioning factor. The porters at Rinjani are humans out of this world that I have high respect for. Carrying weights of at least 40kg on a bamboo shoot with/without sandals and could go triple the speed of us is so commendable. I just can’t help but ponder how growing up in such community and environment has made them my superhero. This means that it is possible for us to always to learn new things or to achieve a high standard. If we want to wake up at 6am daily to kickstart our day, then surround ourselves with people who wakes up at 6am daily. We just have to either be in such environment or create one for ourselves to achieve such goals. 5. Taking control of my life to move on. Reaching the peak made me realised that I still have it in me to take control of my life to chart out what I wanna do and achieve in my life. It was almost a year’s of struggle moving on after knowing that I was cheated in my previous relationship. Some people say that it should be something that’s easily to move on because it’s not about you, but the struggle is really tough when the question “Why” surfaces and self-doubt is the only answer that I could came up with. What I have learnt since then is a lot of us have a dogma that humans are are creatures of monogamy and have to be loyal. Our attachment to what a relationship suppose to be is the one that brings along this suffering. The event is a neutral one, but the feelings associated with the event is what affects us. It was a constant battle of me controlling my life versus letting the event to control me for the past months. After the climb it felt good again to know I can take control of my life, my mind once again and it all starts with forgiveness. My empathy goes out to those who went through the same. It’s not as easy as what they show in the movies, but it’s something that we would have to go through to make us stronger and make us appreciate what life has turned out to be.